International Symposium on Agriculture and Environment (ISAE 2019) 28th February 2019, Organized by Faculty of Agriculture, University of Ruhuna. The 16th Academic Sessions and 15th Vice Chancellor’s Awards Ceremony of University of Ruhuna will be held on 6th March 2019 at the Faculty of Science, University of Ruhuna, University of Ruhuna. The 6th Ruhuna International Science and Technology Conference is organized by the Faculty of Science, University of Ruhuna, Sri Lanka. 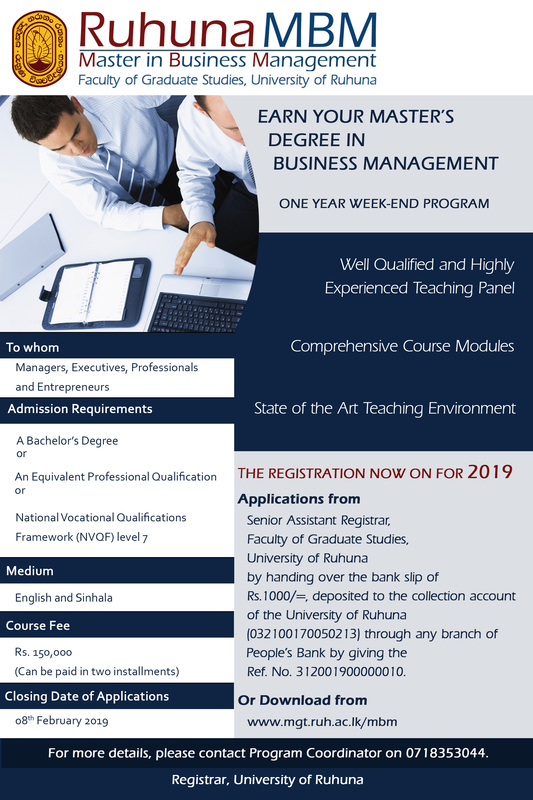 Online Registration for Admission Year 2017/2018. You will be informed your login information to the RUMIS with the Invitation Letter from the University. 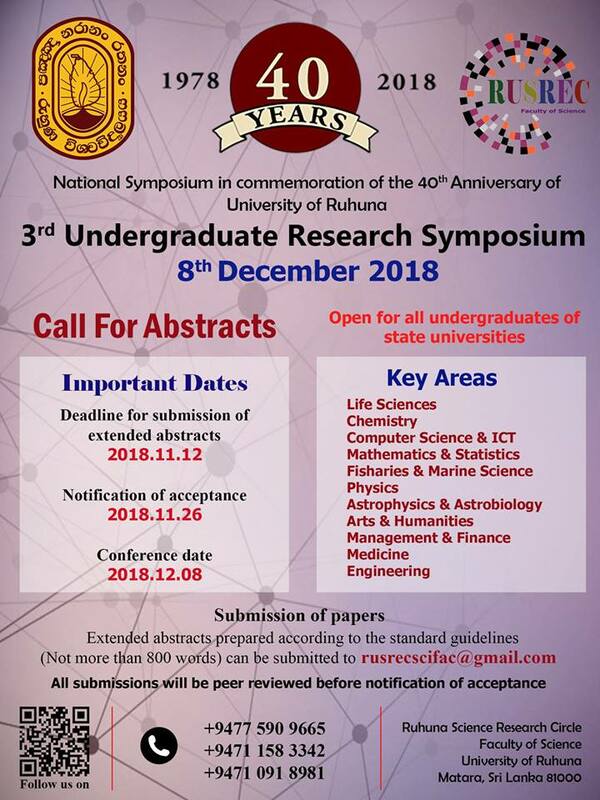 The 1st Research Symposium organized by the Faculty of Allied Health Sciences, University of Ruhuna, Sri Lanka will be held on 08th November 2018. ICME 2018 was provides an opportunity to academics and professionals from diverse disciplines and all across the globe to engage in this prolong debate, sharing their research findings in order to push the boundaries. Vacancies for posts of Temporary Lecturer and Temporary Demonstrator in the Department of Oceanography and Marine Geology, Faculty of Fisheries and Marine Sciences and Technology, University of Ruhuna. Department of History and Archaeology, Faculty of Humanities and Social Sciences, University of Ruhuna is pleased to organize an International Workshop and Lecture Series on Recent Advances in Indian History and Archaeology and Sri Lanka- South India Relations on 5th and 6th September 2018. Applications are invited from suitably qualified candidates for the post of Temporary Assistant Lecturers in the department of Geography,Faculty of Humanities and Social Sciences,University of Ruhuna. Govi Nena Project is Real Time Mobile-based information system to achieve Food Security for the country and stable and sustainable prices for farmers and consumers. The project will enhance the growth and long term sustainability of the Sri Lankan Agriculture Sector. We are looking for a research assistant, and a developer who wants to join with us. Applications are invited from suitably qualified candidates within the University for the ablove post. Department of Computer Science of the Faculty of Science has several vacancies for Temporary Demonstrator/Tutor positions.